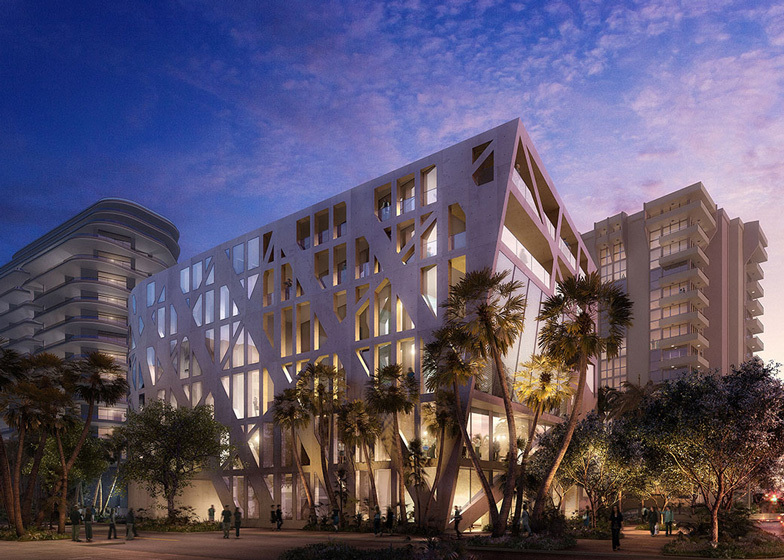 Design Miami 2013: architects OMA and Foster + Partners will work alongside Hollywood power-couple Baz Luhrmann and Catherine Martin to create a new ocean-side cultural quarter at Miami Beach in Florida, it was unveiled during Design Miami earlier this month (+ slideshow). 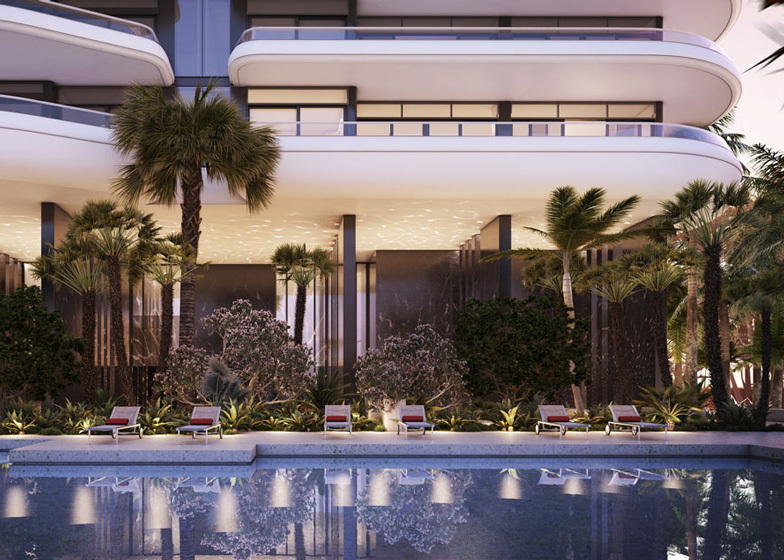 Faena Miami Beach will include an arts centre by OMA, a beachside condominium tower by Foster + Partners, and a restoration of the landmark Saxony Hotel by husband-and-wife team Luhrmann and Martin. The all-star cast has been assembled by Argentinian hotelier and property developer Alan Faena, who presented the plans during the Art Basel and Design Miami fairs in the city earlier this month. 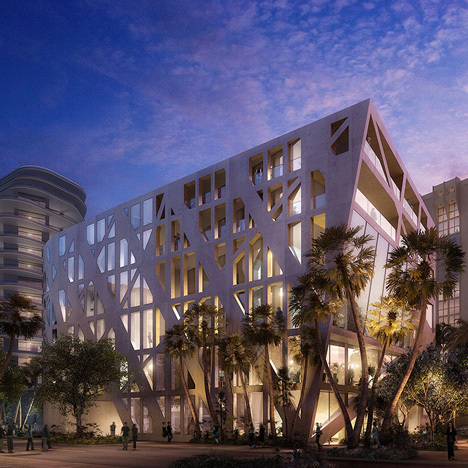 "In Miami Beach we are creating a new epicentre for the city," Faena said. "Acting as curators, we are commissioning a group of standout talents to create an urban installation without equal." 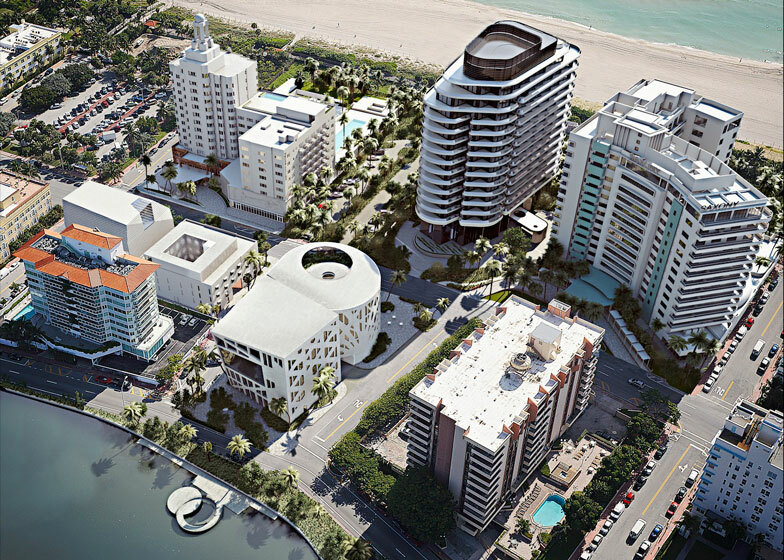 Faena Miami Beach will stretch six blocks along Collins Avenue, between 32 Street and 37 Street, and extend from the Atlantic Ocean and the Indian Creek waterway. 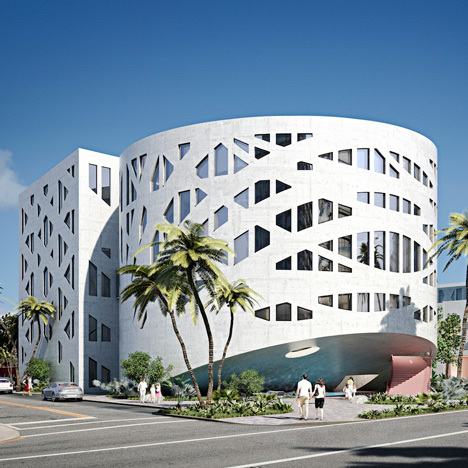 OMA's Faena Arts Center, due to open in spring 2015, consists of a cubic volume and a cylindrical volume, both featuring diagonally banded facades. 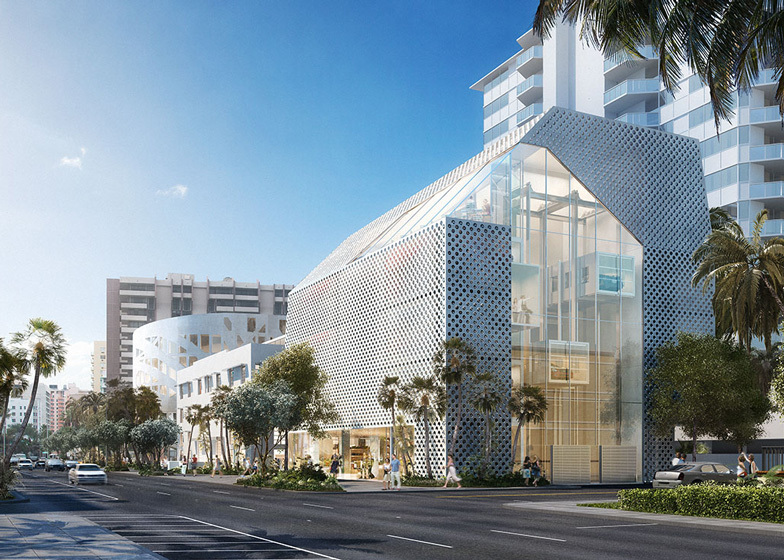 The development will also include two further projects by OMA: the Faena Bazaar retail building and Artists-in-Residence Center and Faena Park, an automated car parking garage. "We were invited to design three buildings - an arts centre, retail bazaar and car park," said OMA New York director Shohei Shigematsu. "These distinct functions are linked by a sequence of public domains including a plaza, courtyard and marina dock." 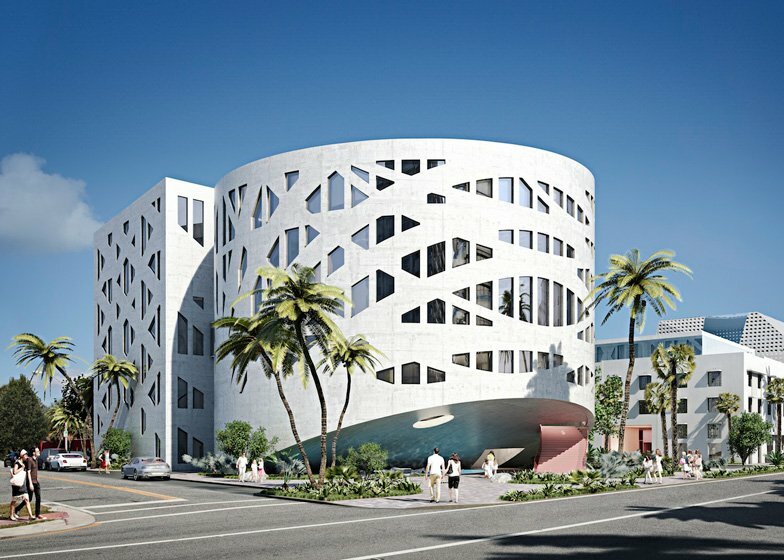 "Culture is at the core of Faena’s vision, and has been the driving force for our collaboration in Miami Beach," Shigematsu added. "By curating their neighbourhood with programmatic diversity, Alan’s sphere of influence will likely extend beyond this development to the rest of Miami Beach." Foster + Partners' 18-storey residential tower, Faena House, will feature distinctive wraparound, Argentinian-style "alero" covered terraces on each floor ("alero" is the Spanish term for a projecting eave). 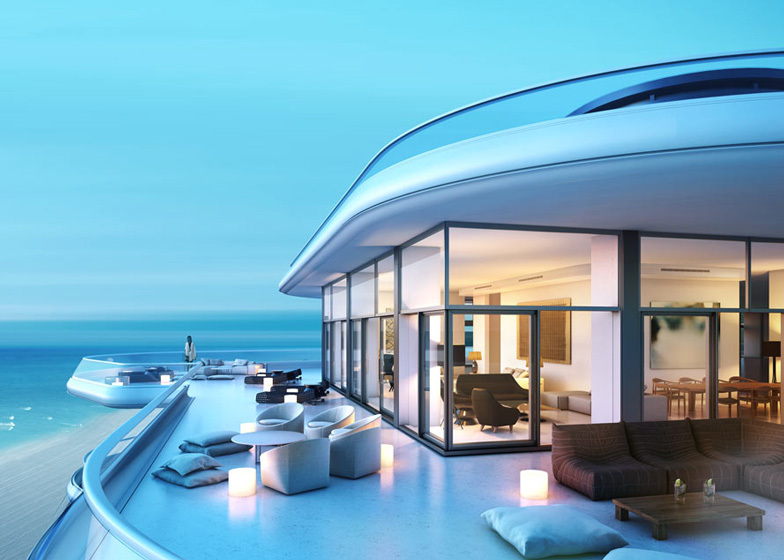 "We were talking about the nature of indoor and outdoor living, remarking on how much one used the alero, the outdoor terrace," said Brandon Haw, senior partner at Foster + Partners. "This really became very much the leitmotif of the project." 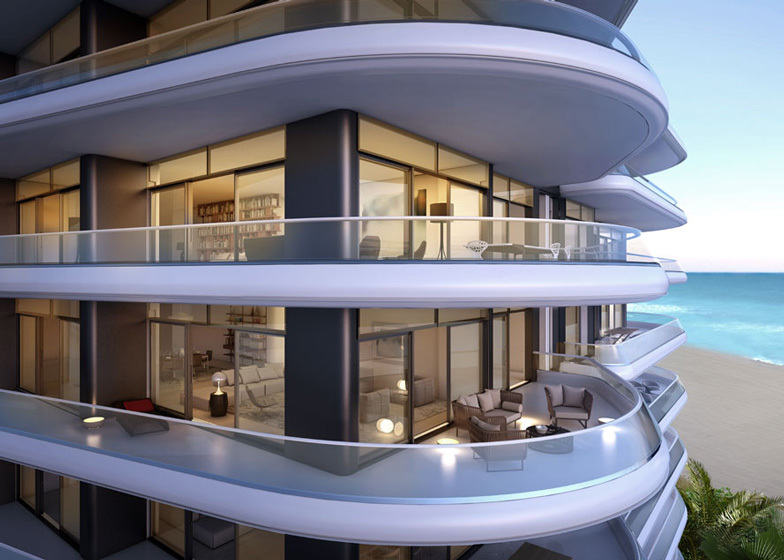 The aleros will be up to 37 feet (3.3 metres) deep and the glazed walls of the apartments will feature sliding glass doors up to 12 feet 6 inches (3.8 metres) wide, allowing the terraces and interior spaces to be used seamlessly. The building will also feature a lobby with water pools to help cool the ground floor. Film director Luhrmann and production designer Martin, whose credits include The Great Gatsby and Moulin Rouge, will oversee the renovation of the Saxony Hotel. Built in 1947, this was once one of the most glamorous luxury hotels at Miami Beach. Luhrmann and Martin will oversee the design of the 168-suite hotel - including the interiors and the staff uniforms - as well as curating entertainment in the theatre, cinema and public spaces. The hotel is due to reopen in December 2014. The project is the latest in a string of new developments by high-profile European architects in Miami, which is rapidly establishing itself as the most architecturally progressive city in the USA. New apartment towers by Zaha Hadid, Herzog & de Meuron and Bjarke Ingels Group have been announced this year, while OMA recently won a competition to rebuild the Miami Beach convention centre. Faena Miami Beach is the first project outside Argentina by Faena, who previously turned a stretch of abandoned docklands at Puerto Madero in Buenos Aires into a thriving arts-led urban quarter, featuring the Faena Hotel designed by Philippe Starck and the Faena Aleph residential buildings by Foster + Partners.